Saturday’s Gulfstream Park feature, the $75,000 Boca Chica Stakes, will have a familiar look to fans who were at the track three weeks ago. The Boca Chica is 6 ½ furlongs on dirt for Florida-bred fillies and mares three-years-old and up. It is the ninth race, with scheduled post of 5:30 p.m. First post is 1:15 p.m. for the 11-race card. For four of the expected starters, the Boca Chica will be a rematch of the six-furlong Sea Lily Stakes at Gulfstream on June 4. Winning for Sarah and Savingtime, second and third respectively in the Sea Lily, are back for the Boca Chica. So are Double Secret, fourth in the Sea Lily, and Dogwood Trail, the horse that finished sixth and last in the Sea Lily. My Miss Venezuela led from gate to wire and won the Sea Lily by 2 ½ lengths over Winning for Sarah, in the modest time of 1:10.86 on the track listed as fast. My Miss Venezuela is a Florida-bred, but is not in the Boca Chica. She is nominated for the $200,000 Princess Rooney (Grade 2) at Gulfstream on July 2. That seven-furlong race is part of the Summit of Speed card. Fusaichi Red, fifth in the Sea Lily, is a Kentucky-bred and thus not eligible for the Boca Chica. Moment of Delight, Pursuing Fate and Fulfilled Fantasy are the other horses in the seven-horse field. Past performances indicate that Dogwood Trail, Double Secret and Fulfilled Fantasy could seek the early lead. Winning for Sarah and Savingtime are in posts six and seven, respectively, and could benefit from a fast pace. 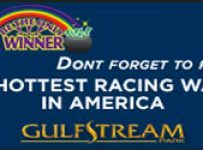 We will be at Gulfstream during the afternoon, and on our blog we will have a preview of the Boca Chica and other race coverage. Five of Saturday’s races (the even-numbered ones) are scheduled for turf—all with the rail at 84 feet. As of 8:45 a.m. conditions are listed as fast for the dirt and firm for the turf. According to the Weather Channel, there is just a 15 percent chance of rain during racing hours in Hallandale Beach where Gulfstream is located.